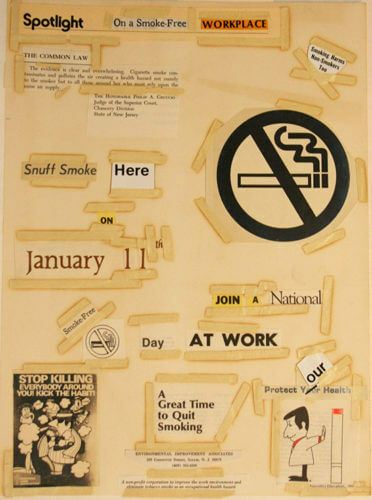 UCSF has been collecting materials on tobacco control efforts since the 1990s. Stemming from events such as the multi-state lawsuit and Master Settlement Agreement and buttressed by the work of Stanton A. Glantz in the Center for Tobacco Control Research and Education, we have collected papers and organizational records of government agencies and activist groups, as well as papers of individuals active in tobacco control. We have an extensive video library that includes anti-smoking public service announcements, news programs and documentaries. The paper and media collections are available for reference use at the UCSF Library’s Archives & Special Collections department. For information about making an appointment, use the calendar. The full list of our manuscript collections with detailed inventories is available on the Online Archive of California. A collection of resources for anyone interested in the global tobacco epidemic, tobacco control policy-making, anti-tobacco advocacy and tobacco litigation. Truth Tobacco Industry Documents Library An online archive of 15 million documents created by tobacco companies about their advertising, manufacturing, marketing, scientific research and political activities. Tobacco Litigation Documents Court documents that provide background on the tobacco documents: where they came from and why they are publicly available.